There is little remarkable about an established interior designer buying an architecturally significant home. It happens all the time. In this case, however, we’re talking about Atlanta-based Bill Stewart, who in 2016 purchased a Old Las Palmas estate and teed up a seven-month renovation. He added subtle, modern updates to the 1964 structure. Original plans by Albert Frey and Robson Chambers sat close at hand. Fresh landscape choices now reflect personal taste, ease of maintenance, and an eye toward water conservation. Stewart played spa director in the front courtyard, installing a long, low fountain with three jubilant bubblers. Past the quintessential hedge and across picnic-ready green turf, double front doors loom as tall as the house itself — a watchful pair of mod, dark-shadowed eyes. As both starting point and finishing touch, Stewart douses the exterior in pink and the interior in green. Suddenly this born-again Frey-Chambers is hosting modernism events and cars are slowing for a look. Vivacious models throw themselves in front of the gate for a photo, blocking the drive when Stewart needs to run errands. Bill Stewart and his husband, Joe Gyori, stroll in front of one of the house’s original screens. The home’s former shroud — a drab stone-ground Dijon mustard yellow that bordered on bland khaki — never roused this three-bedroom, three-bath from its neutral stupor. For years it sat stuffed with sensible contemporary furnishings. It passed unnoticed as if it were an ’80s tract home in Rancho Cucamonga. Stewart changed all that. Once he had the keys, vats of Sherwin-Williams’ Flora & Fauna rained from pink clouds in a desert downpour. The home finally had an appropriately flashy caftan to wear, one that matched its cool ’60s architecture. Inside, Dunn Edwards’ Olive Oil coats every interior wall in the absence of tile, chartreuse grasscloth, or the original travertine. 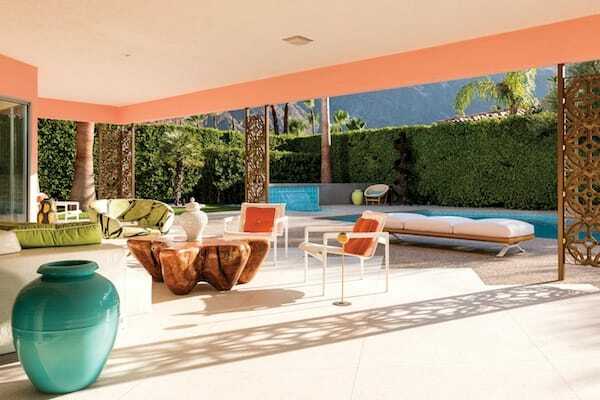 The truly remarkable facet here, beyond the midcentury-goes-preppy scheme, is a transformation that demands more from its viewer than just attention. 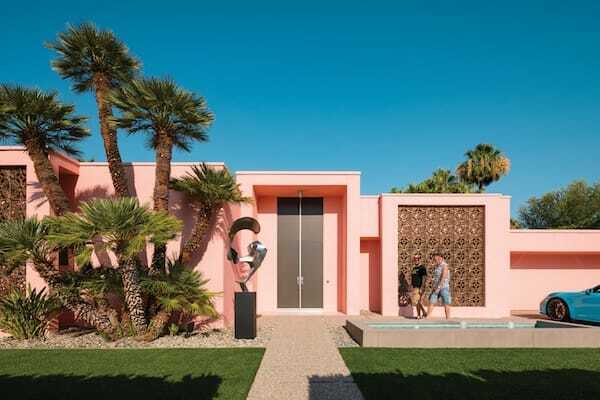 The Palm Springs identity thrives on paint chips and preservation, on historic homes that reemerge before the public eye, evolving from snoozy sleepers to fast backdrops for fashion shoots on the sly. We collect homes that bear certain autographs on their flaking blueprints. We track whose hands they fall into, fight for their salvation, applaud their careful restoration, and endeavor to tour them — especially when it means raising revenue for the cause. We care about Bill Stewart and every last Frey-Chambers on the map. We want to get inside, and this designer has made it worth the effort, has justified our collective passion. Furniture, lighting, and artwork from three previous homes have followed him here. A light mix of vintage Moroccan rugs, pillows, and lamps honors what he calls the ’60s modern Moroccan look of the front of the house. These lend a sultan’s luxury to American and European pieces from the ’60s, ’70s, and ’80s in wood, brass, and stainless steel. 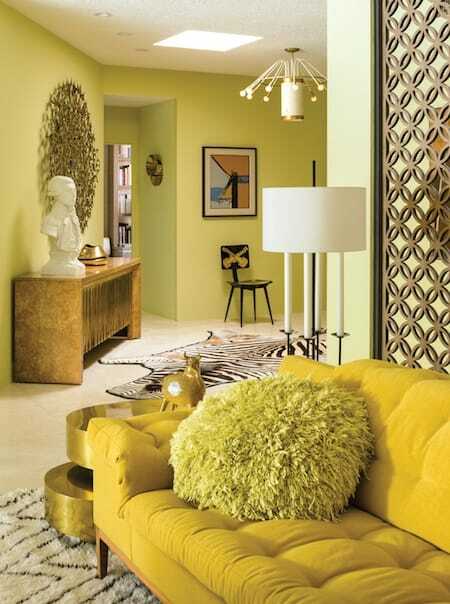 Each room shows the designer’s style evolution, toned and taut after stretching it through myriad styles since 1978. 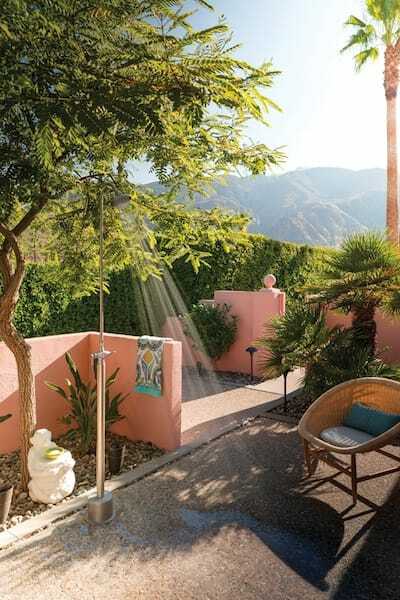 An outdoor shower affords a view of the San Jacinto mountains. The home is positioned across its lot in a simple, straight-lined series of boxes. Inside, it gives way to strategic angles. Enter the three-sided foyer that slants into the living room. Step on zebra. Feel the vacant stares from the den, where a photograph reveals two spray-tanned blondes casting a look of indifference that borders on loathing. “It’s very Stepford Wives,” says Stewart of the photograph from a Versace ad campaign. “It’s actually Los Angeles, a home in Hancock Park. I just love the blank stare, the empty quality, almost like mannequins. They don’t even look like real people.” He turns back to the zebra. A spiky mohawk, mere remnants of a mane, tufts up from its flat form. Cheery, unexpected details await around every corner. Stewart tours through his home like an espresso-fueled docent. He doesn’t take a breath nor miss a detail. Dressed in a sleeveless plaid shirt, jean shorts, and work boots with tube socks, he appears more suited to selling taxidermy from his cantilevered cabin in Idyllwild than like someone whose environments have inspired readers of Architectural Digest, Elle Décor, House & Garden, and Metropolitan Home. Here he favors citrus tones, fluffy rugs on slick floors, and California’s quirky midcentury artifacts, including a knobbly wood chair and ottoman covered in sheepskin from Santa Cruz. Cartoonish Japanese artwork and a canvas by Peter Max join a series of miniature paintings that pay tribute to Palm Springs architecture, including Frey’s. The couple purchased their Frey-Chambers after outgrowing an Alexander home in Las Palmas. The sellers accepted their offer before the home could hit the MLS. Bill Stewart isn’t afraid to put his vintage furniture to good use, even outside on the patio. 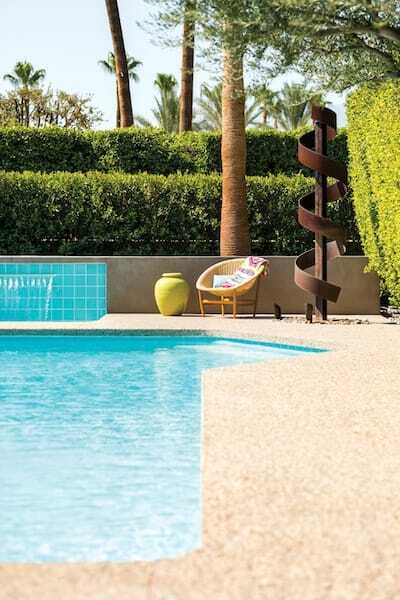 A few well-placed items accent the pool area. 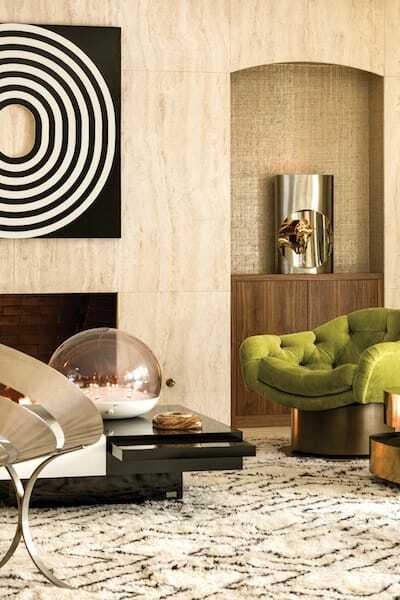 In the olive-colored entryway, guests can observe Stewart’s penchant for combining fuzzy with slick. The glass-encased bedroom demonstrates the owners’ embrace of vivid colors and textures. Stewart fell for the pool. Shaped almost like a go-go boot, it has three steps that descend into the water at its toe. The home’s 2,800 square feet can host family comfortably without excess. The roller rink–size lanai was another plus. “This is the old living room furniture from the other place,” he says, motioning outdoors. Some collectors won’t let guests within three feet of a Pucci chair. Stewart keeps his Emilios on the patio. Dunn Edwards’ Olive Oil now coats the walls, a light yet robust hue easily mistaken for its rival, Avocado. “We avoided the typical candy colors,” he says. The result is a kettle-corn effect: sweet on the outside before you reach the savory. It’s a color scheme Stewart likens to the Beverly Hills Hotel. A photograph of aggressively indifferent blonde models from a vintage Versace campaign. Among successful interior designers, few wake up in a home built by Albert Frey, a man whose career helps to draw 97,000 enthusiasts during 10 days of annual modernism madness. Stewart pushes aside the angled wall of glass that links the master bedroom to the pool and stops under the cool shade of the covered patio. This month through January, the Palm Springs Art Museum presents Albert Frey and Lina Bo Bardi: A Search for Living Architecture as part of the Getty-led program Pacific Standard Time L.A./L.A., Latin American & Latino Art in L.A. The five-month collaboration across Southern California arts institutions explores the region’s historic impact on art and architecture. Though we tend to drop Robson Chambers from casual notations, he belongs on any local Mount Rushmore monument to modernists. He joined the firm of Frey and John Porter Clark, where he remained for 10 years after Clark left, spreading the modernist gospel with Frey. In midcentury’s crescendo of 1966, however, Chambers left for the coast as campus architect for the University of California, Santa Barbara, before “retiring” to Borrego Springs in 1980 and setting up a small practice until 1995. Frey and the lesser-credited Chambers are known for Palm Springs Fire Station No. 1, Palm Springs City Hall (with Clark), and the Tramway Gas Station, now the Palm Springs Visitors Center. Stewart’s home predates the latter by one year. “We really don’t know how much input each man had,” says Stewart. The exterior remains virtually unchanged since 1964. Fifty-three years later, the home’s lack of modifications, among other factors, make it eligible for Class I historic status. Barbara and Ron Marshall of the Palm Springs Preservation Foundation adopted the project and submitted a nomination to the city’s Historic Site Preservation Board last April. After unanimous approval, it remains under consideration by city council. Known formally by the names of its original owners, The Mr. & Mrs. Carl E. Haymond Residence was born in the Las Palmas Estates tract. More than 170 decorative but functional cast-aluminum grille units designed by architect John deKoven Hill shield the rays throughout the residence. They are easily the home’s most notable feature. 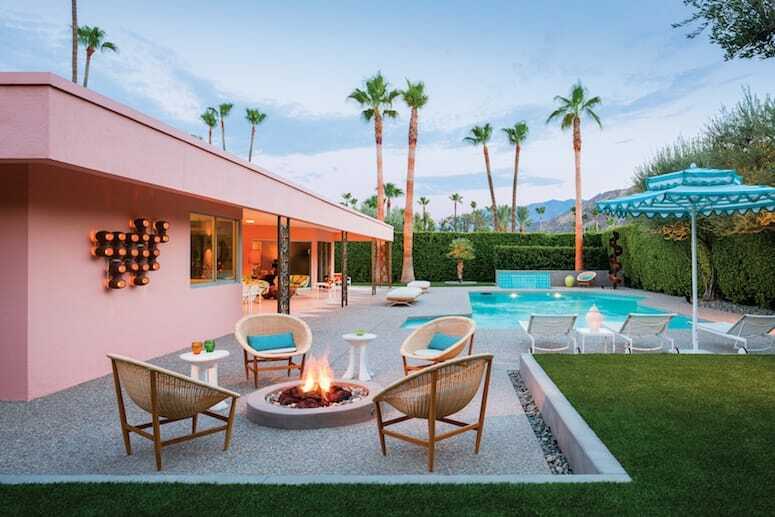 Stewart likes to say, “You don’t have to be into ‘the midcentury thing’ to restore a house.” Distinct architectural styles that have developed in Palm Springs since the 1930s add homegrown charm. “It’s part of the reason people come here and part of the reason people make it their second home,” he says. Stewart himself had hankered for a vacation home in the Hamptons when a friend in New York told him to check Palm Springs instead. 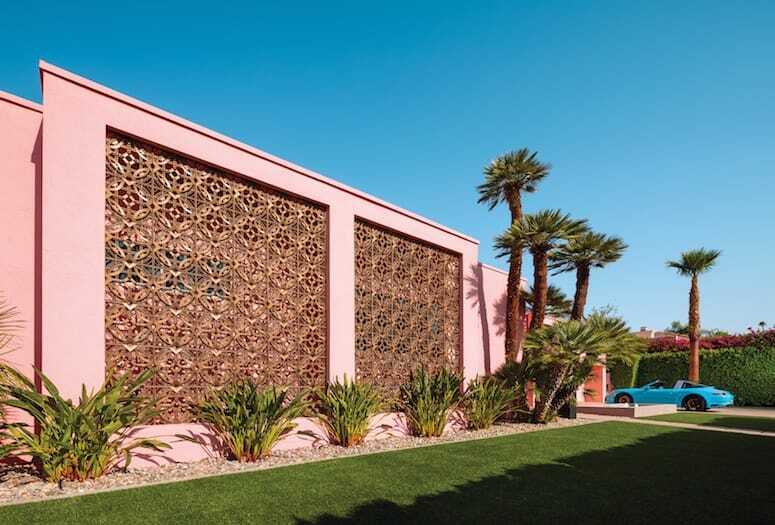 “I said, ‘That’s 2,000 miles away.’ He said, ‘Go out there and see what you think.’ I came out here, and I fell in love.” Two homes later, he sees Palm Springs’ historic residence inventory as a chance we shouldn’t waste. In a neighborhood where tourists are tempted to peek over hedges, his pink Frey-Chambers stands tall enough to glimpse the empty street. The flat top of the home’s head pops up over the old-growth privacy wall. To the rare passerby, it looks as curious to grab a piece of the world as the world has been to grab a piece of the reimagined home. Poor home doesn’t know. The most remarkable view comes from within.